The well known manufacturer of gadgets for home theater, Onkyo has announced three new Sotec C204 series netbook. All the netbooks are powered by Intel 1.6GHz Atom N270 CPU for improved mobile lifestyle. The netbook is featured with a 10.1-inch LED backlit display with 1024 x 600 resolutions. 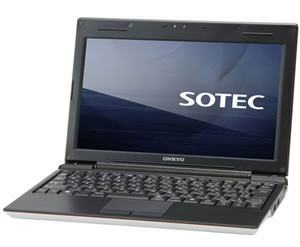 Featured with a 32GB of solid-state drive, Sotec C204 series netbook is also equipped with a 1.3-megapixel camera, integrated with Wi-Fi, comes with three USB ports, has built-in VGA video output and supports Ethernet connection via USB adapter. In addition, it comes with a 1800mAh battery that provide up to 5 hours usage life. The C204 series netbook weighs 2.1 pounds and is 0.9-inch thick is expected to be available by end of May in Japan. The price is estimated to start at $530 with tax included.